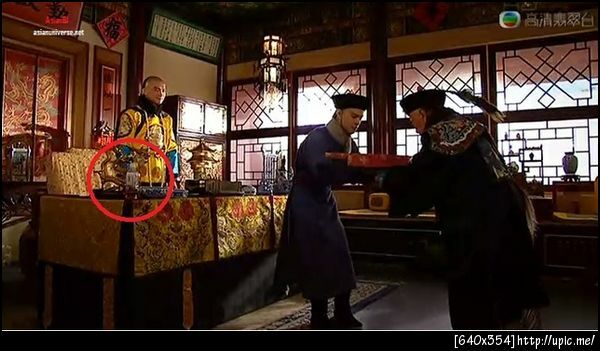 Netizens spotted a water bottle in TVB's anniversary series Curse of the Royal Harem (CRH). In episode 19, the scene was about Sunny Chan's role as Emperor Guangxi (Do Gwong) discussing business with the imperial officials, but when the camera zoomed out, an empty water bottle was seen sitting on the emperor's desk. Netizens screen captured the goof, posted on discussion forums and ridiculed TVB for playing with 'time travel'. Netizens also made a spoof by putting the caption, "TVB is amazing" underneath the screencap to further ridicule TVB. Netizens madly criticized TVB for making another sloppy production. Netizens speculated that someone finished the bottle and just conveniently placed it on the set, but none of the artists or staff noticed. Even when the crew were editing the scenes, still no one spotted the mistake, seriously careless! One Netizen joked and wondered if this was a marketing technique by the sponsor. Reporters contacted CRH's producer Chong Wai Kin, he expressed he was notified about the mistake earlier this morning. Then he immediately went back to rewatch the original. Producer Chong said: "We often complete the scenes in 1 take. Perhaps we accidentally placed the cut camera shots back into the scene. I'm not sure if if it's a human or computer error. We are responsible for this, and in the future, we will review the series a few more times to ensure there are no errors before broadcasting." He also expressed his gratitude to the person who spotted the mistake and for their support.